Sadly, Super Back to the Future, Part II was only released in Japan in 1993. It never had a U.S. release. Note 1: Like platforming/action games? Check out my reviews of Doki Doki Panic, Kid Dracula, I’m Kid Dracula, and Splatterhouse! 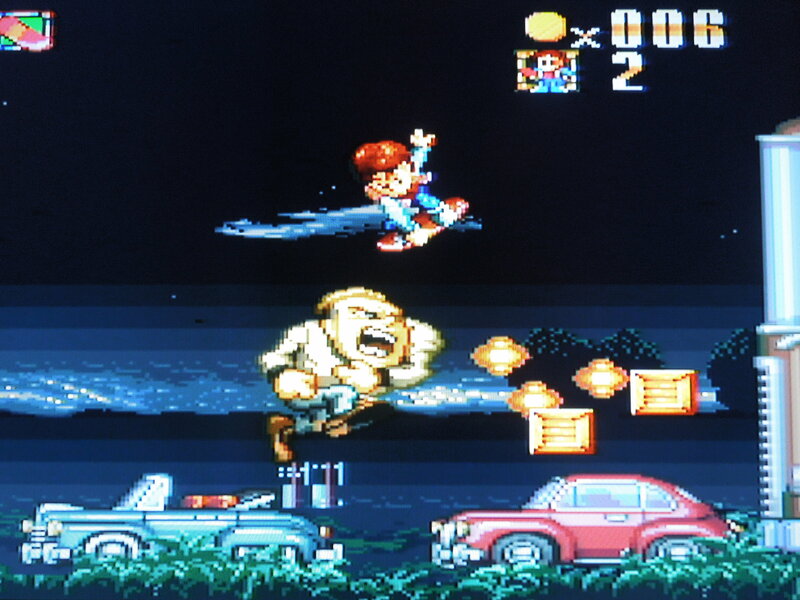 Note 2: This game was played on an original model U.S. Super Nintendo with S-Video cables connected to a 32-inch HD tv. The plastic tabs that prevent Japanese Super Famicom games from being inserted into the Super Nintendo console were removed, allowing the game to be inserted for play. 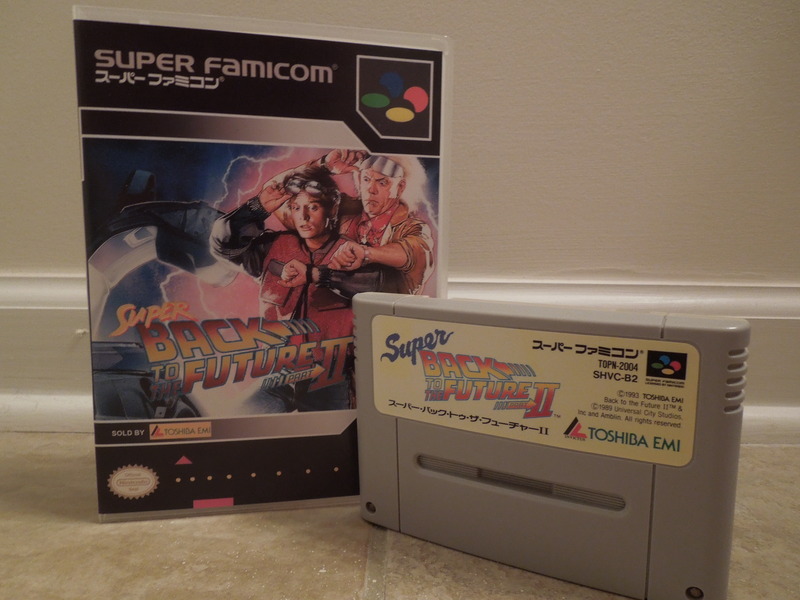 Quick History: Released only in Japan in 1993, Super Back to Future, Part II for the Super Famicom (Japanese SNES) followed the story of the movie with the same name. Perhaps one reason this game was never released in the United States for the Super Nintendo was the timing of its release. The film, Back to the Future, Part II had been released 4 years earlier, in 1989. Perhaps there was a fear that, after 4 years, U.S. gamers would have lost interest in the film, and therefore the game would hold no interest either. 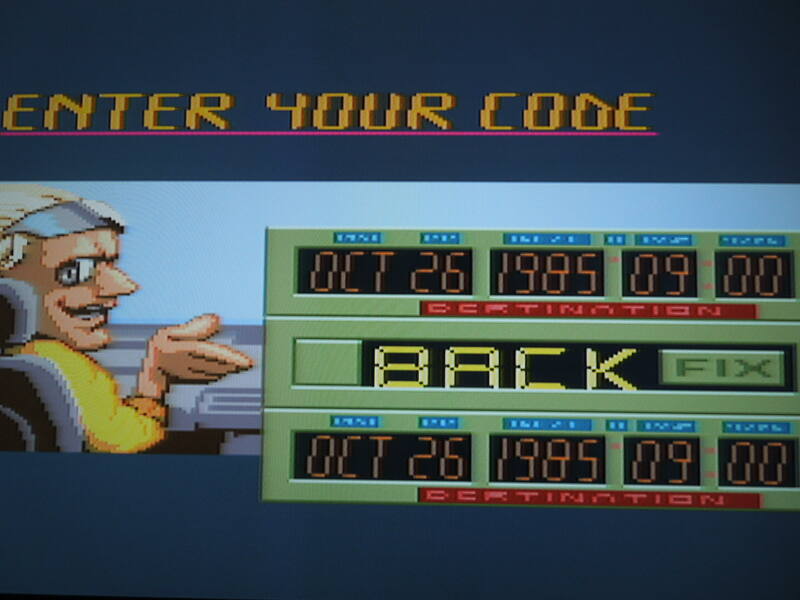 That is a shame, however, because previous Back to the Future games (released for the NES and Sega Genesis) were not well-received by U.S. gamers, and this game likely would have, in the least, been an acceptable version of a Back to the Future video game. You’ll face all sorts of strange enemies and obstacles throughout the game. Story: If you aren’t familiar with the film, Back to the Future, Part II, here’s the gist: Marty, a 17-year old kid, travels via DeLorean time machine from 1985 to 2015 (along with his mentor and buddy Doc) to stop his kids from making horrible mistakes that tear his family apart. While in 2015, he buys Gray’s Sports Almanac, a sports book that lists scores from the past 50 years – his intention is to bet and win on sporting events back in his own time. Naturally, the book gets stolen, and hijinks and adventure ensue as Marty tries to make things right. I highly recommend the entire movie trilogy, if for some strange reason you haven’t seen it (which is unlikely, I guess, if you’re even reading this). Control: Marty, who rides on his ‘hover board’ at all times, only has two functions – Dash and Jump. To dash (or move really fast on your hover board), press and hold B, X or R. To jump, press Y or A. You can’t change the control scheme, but I recommend holding the shoulder button R for Dash, and using A for jump. When jumping, Marty somersaults repeatedly, and he is essentially invincible while doing so. He’ll destroy enemies and bounce into the air while somersaulting/spinning. Dashing is great for…moving fast…but you have to be careful not to dash into an enemy, which can happen easily once you really get moving. Gameplay: You guide Marty throw 6 levels of platforming action. The levels, however, are broken down into hypenated sub-levels. For example, level 1-2, level 5-3. It’s similiar to Super Mario Brothers, but not every level has the same amount of sub-levels. The levels include areas from the movie, like Hill Valley in 2015, Biff’s Paradise Casino & Hotel in Alternate 1985, and Hill Valley High School in 1955. 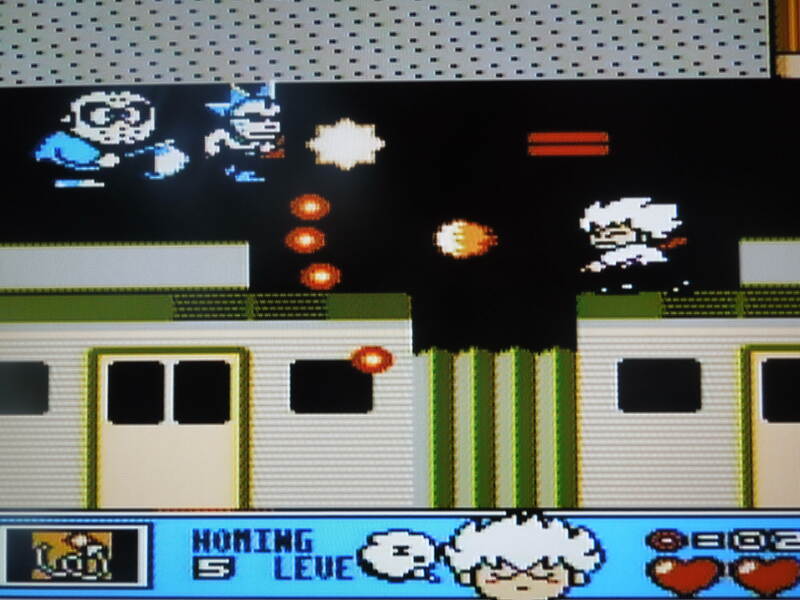 Marty can take 3 hits per level before dying, and his ‘energy’ is in the form of 3 hover-board icons in the top left corner of the screen. 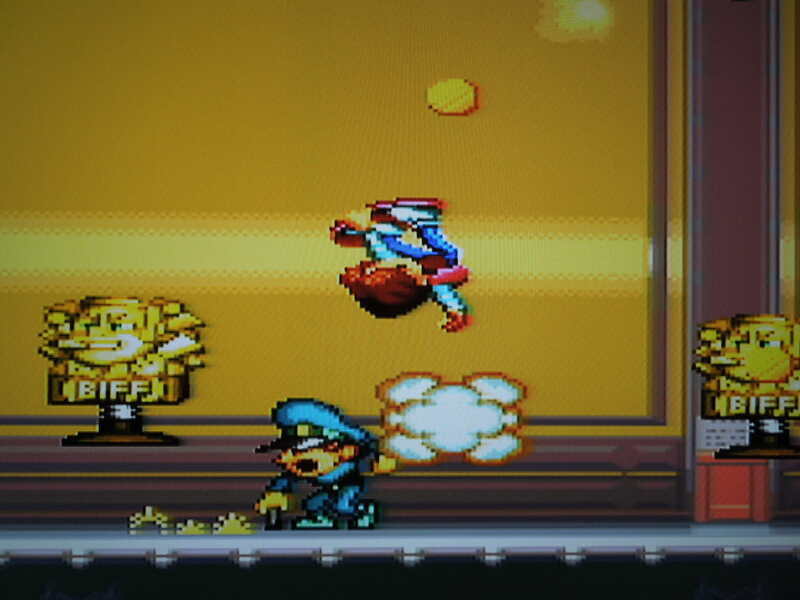 Throughout each level (excluding ‘boss fight’ levels), you’ll collect coins that can be used to buy extra energy or protective barriers at certain machines you’ll encounter while zooming around. If you lose all of your energy in a level, you’ll have to start back at the very beginning – no check points are in the levels. Many levels have ‘secrets’ – hidden areas that have extra coins or shortcuts. You’ll encounter all forms of enemies throughout the game, some that have a passing resemblance to something from the movie, some that seem to be completely new to the BTF II world. By jumping (and automatically spinning), you can attack these enemies. Additionally, for every enemey (or obstacle, like boulders) you hit while spinning, Marty will be able to continue spinning and move upwards. 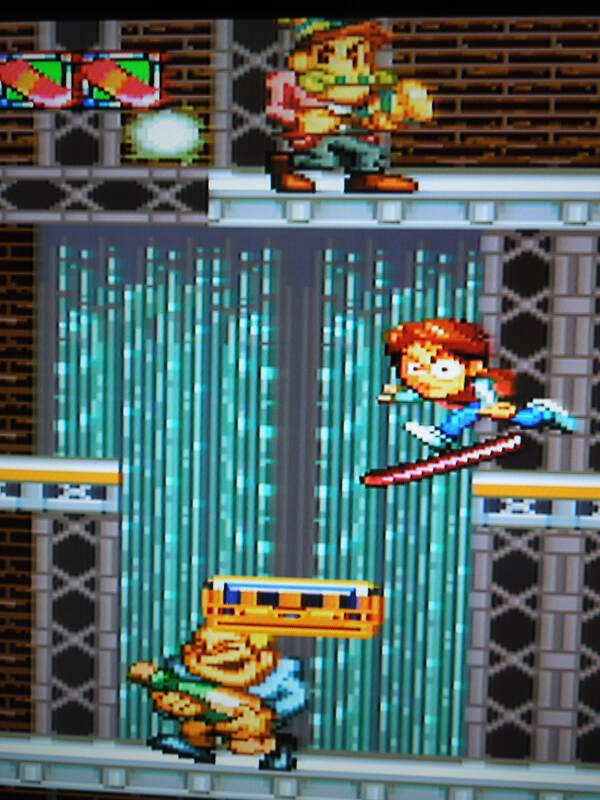 In fact, many levels have you ‘climbing’ – having Marty continue to jump into obstacles to continue spinning upwards to a certain point in a level. You’ll fight bosses every few levels – some of these you’ll recognize, like 2015 Griff, while some have been created for this ‘version’ of Back to the Future II. Sound and Music: The music is well-done. The main theme from the movie plays as soon as you power on the system, and that’s a great way to introduce the game. That same Back to the Future theme plays during several levels as well, and frankly, doesn’t get old. However, because that one song is so great, when other songs play during other levels, it’s just not the same. The sound effects are passable. Language Barrier? No. The Start Screen, Continue Screen, Password, and Options are all in English. You can listen to music from the game or increase your total number of lives (up to 5) in the Options menu. The only thing in Japanese is the story that plays during a few cut-scenes throughout the game. If you’re familiar with the movie, you won’t need to read the language anyway. I do suppose you would be confused if you had never seen the movie. You’ll get a 4-digit passcode at the beginning of each level. Password: At the beginning of every sub-level, you’ll receive that level’s password. They are all 4-letter words, like ‘FROG’ or ‘KING.’ It’s handy. So, where can I find this game? Ebay for a Super Famicom, original Japanese version. 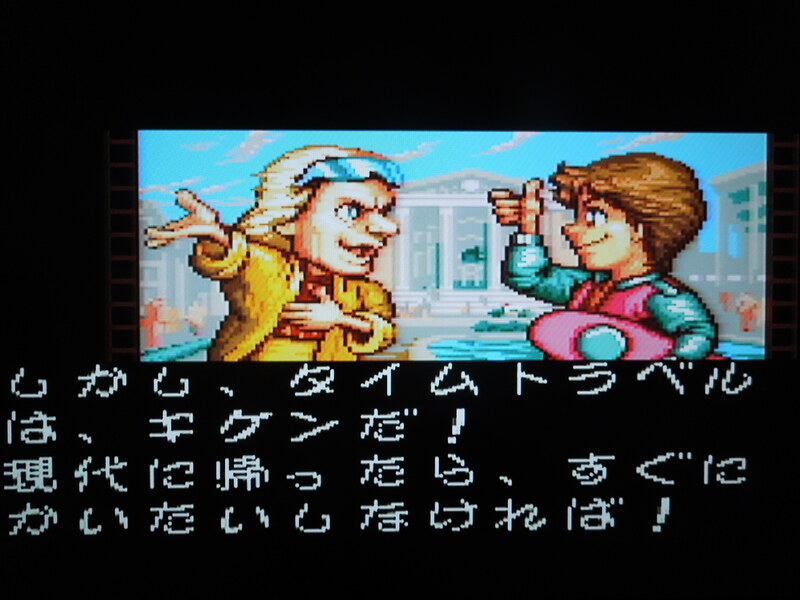 This game has been translated and is now being sold by SNES reproduction websites across the Internet. You can always download the rom for play on a computer emulator. 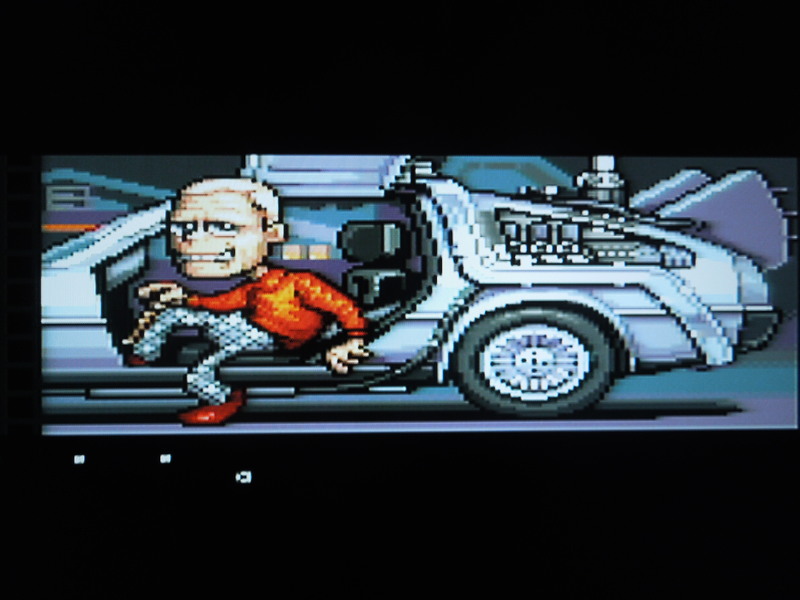 Conclusion: If you’re a huge Back to the Future trilogy fan, then Super Back to the Future, Part II may be just the video game you’re looking for. It looks great – very anime and cartoony – but eye-catching. The original movie music really adds to the experience. But, be warned – this game is HARD. You will die, repeatedly, as you try to conquer each level. The first few aren’t too hard, but it gets tough quickly. It will take memorization, patience, and all your ‘old school gamer’ skills to beat this one. Fortunately, there are passwords after every level. The story is in Japanese, but everything else is in English.